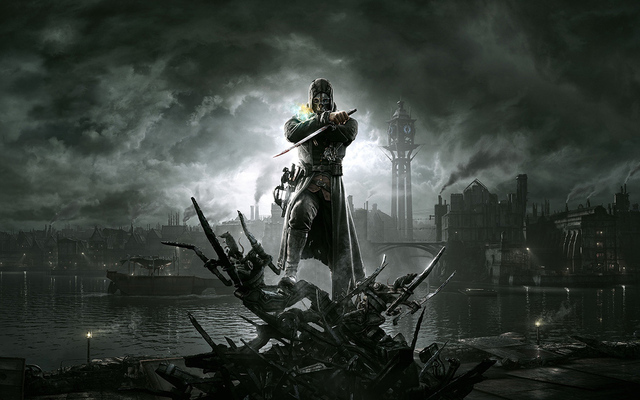 You’re probably sick of hearing me bang out about it but since I gave you my first impressions of Dishonored last week I feel that now I’ve cracked the game it’s only fair that I give it my full verdict. The disturbing setting is the star of the show here and despite not having the most original overlying story (falsely accused of a crime, you must escape prison, seek vengeance, rescue the princess) the game creates a great atmosphere and a believable backdrop to a fantastic adventure. Corvo’s quest is less about killing the corrupt and more about how far he will go for the sake of the young girl whom he is charged to protect. Along the way he makes some good friends and some big enemies each more ruthless and power hungry than the last. 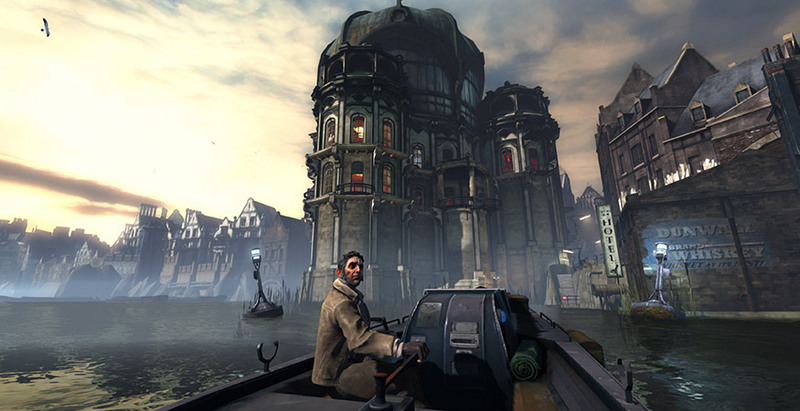 Each level brings Corvo a new target and see’s him dropped off by the riverside and sent out alone to stalk his prey. 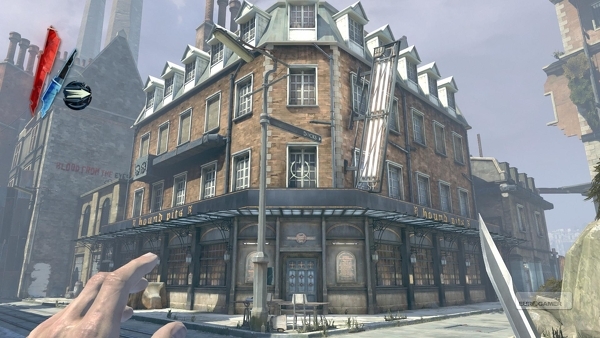 This isolation is prevalent in the game and you find yourself breathing a sigh of relief each time you complete a mission successfully and can return to your friends “The Loyalists” back at your makeshift base in an abandoned pub. The background of the world is described in many books and notes left lying around the various settings and they read very well, unlike in some games where it feels like a chore having to trawl through lines of text to find out that some dude killed some other dude for the sake of some bird, such texts are usually no more than one page and actually add to the atmosphere really well. If you are expecting an RPG experience you will be surprised, yes there are abilities, yes you can upgrade each one but only once. Using items called Runes which are hidden throughout the levels you can upgrade your Corvo in the way of your choosing either make him a more efficient killer or transform him into a ghost moving through the shadows un-detected. These abilities are accentuated with the use of Bone Charms, which can be equipped to give you further abilities (such as extra swim speed, more health from potions, less damage etc). As great as the world is I can’t help but feel they could have made more of the steam-punk setting, there were only a few machines and vehicles that were actually usable or moving the rest were simply there as scenery where I felt they should have been used to a greater effect. There was a distinct lack of pedestrians in the world too, the only time the city felt really alive were in the brothel and party scenes (although this kind of makes sense as the lower echelons of society were in the grip of death with the plague hanging over them). There is stark contrast between the upper and lower classes … just like real life ey? I was slightly disappointed with the ending of the game but having only seen one of multiple endings I suppose it could just be because I played the boring way, I’m really looking forward to getting stuck in again and playing the whole thing through in a different manner. 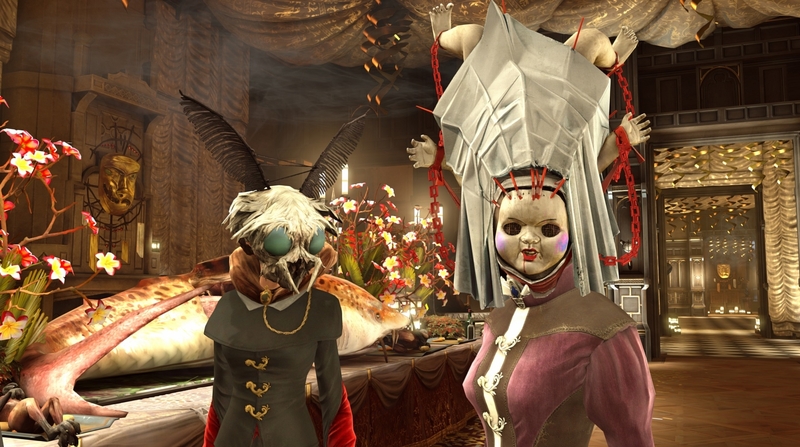 All in all though Arkane/Bethesda have come up with something really special here a truly unique game. 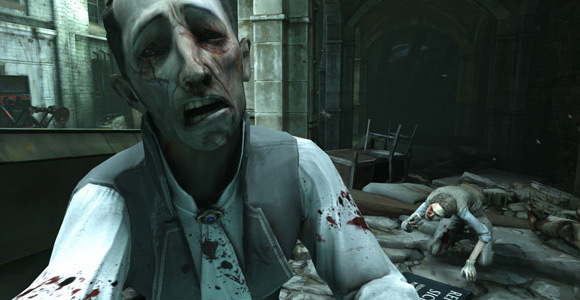 The graphics are brilliant, the gameplay is excellent, the story has darkness and depth. Some people may find the lack of free exploration an issue but the game more than makes up for that in the creativity department not to mention exceptional replay value. If you think you have time for a 15+ hour game before the magnificent fourth Halo then you must buy this one. This entry was posted in Gaming, Tech and Gaming Procrastination and tagged Arkane, bethesda, corvo, Dishonored, dunwall, Plague, XBOX360 by eremenko. Bookmark the permalink. Ok, that settles it. I am buying this game. Yeah it’s worth it man. I don’t think I’ll have the chance to finish it again before Nov 6th but I’m gonna give it a good try.